Sistema Global, the worldwide voice of El Sistema, is a 501(c)(3) nonprofit seeking to connect, encourage, and inspire El Sistema teachers and leaders everywhere. We are expanding our dynamic team of interns and volunteers with opportunities for multiple individuals in the following areas: Marketing, Fundraising, Website content development, Resource page management and Program directory review. Our volunteers have gathered excellent repertoire and resources for use by those in the field. Find materials and add to our library! Support our mission to connect, encourage, and inspire El Sistema leaders, teachers, and advocates worldwide. We can’t do it without you. Our LinkedIn group has many active users who have great ideas and a love for all things El Sistema. Add your voice to the conversation! We published a free, comprehensive Literature Review of El Sistema and Sistema-inspired programs around the world. Get the full review or the summary. Are you looking for an El Sistema program in your area? Use our searchable global directory of local programs to find the one closest to you! More about Maestro Abreu’s passing. 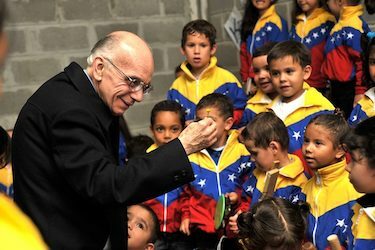 The entire Sistema Global community joins the world in remembering the vision, inspiration and commitment of Maestro José Antonio Abreu. This incredibly kind, giving and beloved individual made an impact on the world that is truly beyond measure. He believed that to have music in one’s life is a basic human right. He changed the idea of making classical music from something reserved for the elite to something essential in the lives of everyone. He believed in social justice and in our responsibility to provide it for children all over the world and for everyone considered to be marginalized. He was so committed and persuasive that he was able to engage world leaders and international change-makers to support his program as well. Today, orchestras around the world engage their communities like never before, providing such opportunities to the poorest and most underserved among us. Maestro Abreu has always been a constant inspiration to all of us. I had the honor of being part of the original El Sistema movement along with my siblings in the early 70s, and I have vivid memories of the kids running to him as a father figure. It was as if he was a magnet for the children. I witnessed the same thing years later when invited back to teach for the program in Barquisimeto and Caracas. This is when he was in his element and seemed so sincerely happy. As world renowned as Maestro Abreu became, the movement was never about him. It was always about the children and the positive impact he could create for their future. Rather than focusing on our sadness at his passing, we should instead focus on our joy and be inspired to share the joy of our work on behalf of the children of the world. That is what Maestro would have wanted us to do. Sistema Global’s mission is to connect, encourage, and inspire El Sistema teachers and leaders world-wide. Our vision is to maintain the most current and comprehensive source of information about these programs, and use this website as a resource which rapidly responds to the needs of our teachers and leaders.